On day 5 of our safari we left Serena Lodge overlooking the Rift Valley near Lake Manyara and started toward Ngorongoro Crater. The drive was a long one and we broke it up by stopping mid-morning at the Endoro Gate entrance to the Ngorongoro Conservation area. There Barbara and I, accompanied by a very tall Park guide, hiked in mountainous terrain for several hours to see the “Elephant Caves” and the Endoro Water Falls. 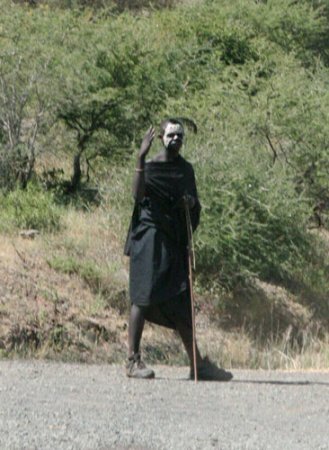 We initially assumed our guide must be a member of the Maasai tribe because of his extreme height, but he was not; he was a member of the Sukuma tribe that occupies the western part of Tanzania near Lake Victoria. They constitute the largest of the 126 tribes of Tanzania, numbering about 10,000,000 out of the total population of about 40,000,000. As an aside, most of the 120 or so tribes are members of the extensive central and southern Africa Bantu family. The nomadic, cattle-owning warrior-tribe, Maasai, are not part of the Bantu family, and there remains a sharp local distinction between them and most other Tanzanians. Until recently in their histories, each of the 126 tribes spoke a different, though often somewhat related language with Bantu roots. These many languages are gradually being displaced by a common Bantu lingua franca, Seswahili, which has gained national acceptance, and international as well, as there are a number of Bantu-dominated societies in other African countries. Almost all of the Tanzanians we encountered also speak English, many quite well, others rudimentary. Raymond is a member of the prominent Chagga tribe generally located along the eastern coast of Tanzania and inland from there. They are noted for their entrepreneurial attitudes, and certainly that was evident from our exposure to the many guides, most of whom are Chagga. Raymond studied English (British style) in elementary school, and at the secondary level all classes are taught in English rather than in Swahili. The hike to the Elephant Caves was longer, hotter, and more strenuous than we anticipated. We finally arrived after a couple of hours on the trail. It seemed like more! We saw a few birds along the trail, but nothing very exciting. Our guide was aware of our interest, however, and made a good effort to point out those few birds that could be seen along the tree-shrouded trail. 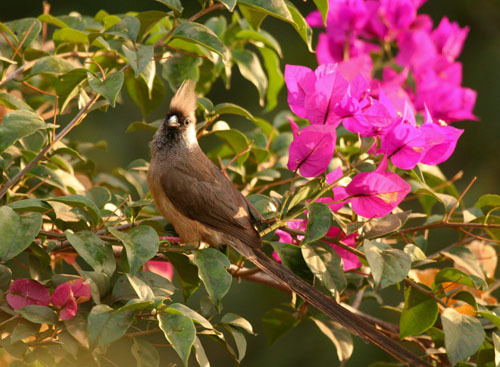 He knew a lot about the local plants and birds, including the scientific names. He would love to go to college and become a biologist, but at his age, 30, that will be tough. The Elephant Caves were not impressive. 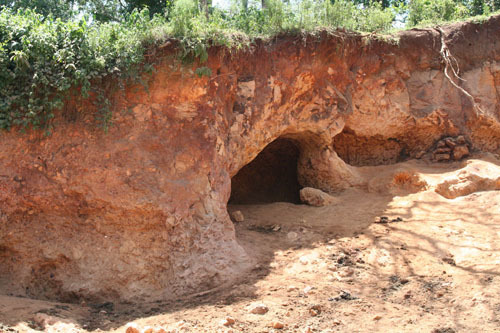 The clay along the river in this area contains minerals that elephants crave. For centuries they have come here to dig up the clay and eat it. A few years ago, as a result of exceptionally heavy rains, the wall of the caves facing the river collapsed, so that the cave is now quite small. The elephants still come and eat away at the wall. Maybe someday they will create another good-sized cave. We had taken quite a long time to hike up to the cave. Our guide suggested that we might want to skip the Endoro Water Falls because the season had been very dry and there was very little water in the river. We readily agreed. After a quick box lunch at the parking lot of Endoro Gate, we headed off for our lodging for the night, near Ngorongoro Crater. Originally we had been tentatively booked into the Sopa Lodge, which is an upscale lodge on the grounds of the Ngorongoro Conservation area, but it was over-booked. Our back-up was an out-of-park facility known as the Coffee Farm. We were actually quite pleased with this facility. The units are strung out along the edge of the coffee groves. They are very old, drab and unattractive from the outside, but spacious and comfortable inside. We enjoyed good food, beer, and great coffee at the large and comfortable central lodge. 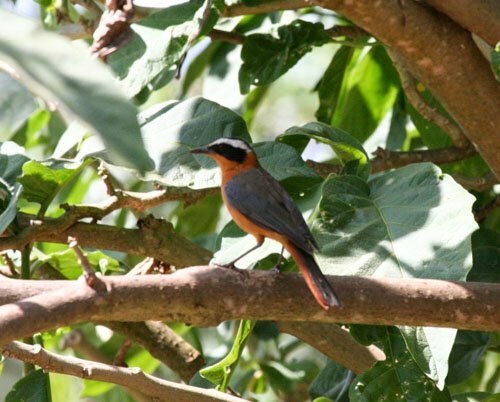 We also enjoyed some decent birding on the grounds including a White-browed Robin-Chat. One of the culinary surprises was the quality of the bacon throughout our trip. At every stop we were able to select bacon for breakfast and it was invariably excellent. It is cut like Canadian bacon, but thin, and fried like American bacon. There is very little fat in it, yet it is tasty. The other delight was the fruit, which was plentiful and flavorful. Passion fruit, water melon and papaya were especially good. Chicken is a staple, and we had a lot of fried chicken in our packed lunch boxes. After breakfast on Day 6, we drove to the Crater. Maasai still reside around the Crater and tend their herds. 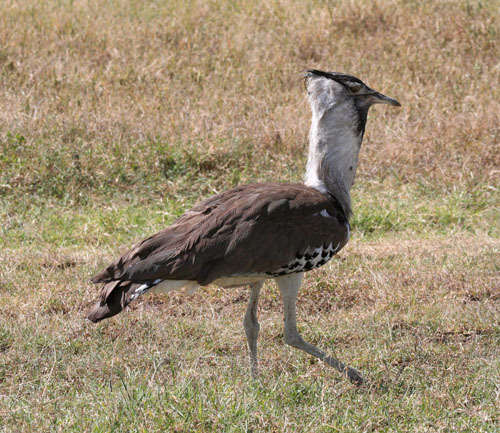 grassland birds, including Red-crowned and Rufous Naped Larks, and Great Bustards. 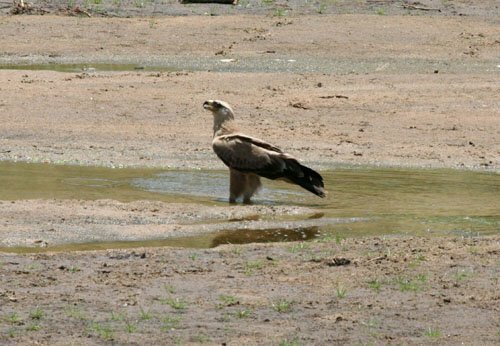 There were a number of Black Kites and water birds near the relatively small ponds found throughout the Crater. 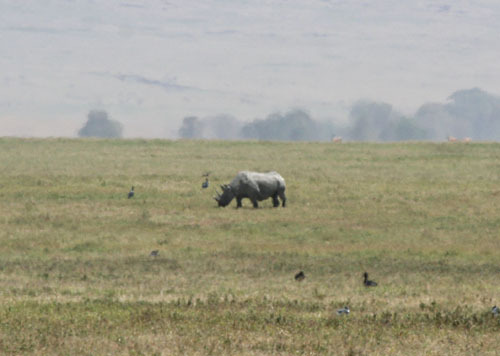 We knew that the Crater was our best chance of finding the second of our top two targets for the trip, Rhinoceros. Mid-morning we were thrilled to see our first Rhino, grazing on the short grass of the Crater floor, but at a considerable distance from us. The Rhinos are greatly threatened by poaching for the Asian aphrodisiac trade. The prices paid for a dead Rhino are fantastic, such as $250,000 for one, primarily just for the powder that comes from its horn, supposedly a great aphrodisiac. As a result there is a constant warfare, and I mean warfare, between poachers and wardens wherever Rhinos still exist. About 10 years ago, the population at Ngorongoro, one of the few places where they still live in the wild, was reduced to 8 individuals. Stepped up protection has resulted in an increase to 15. The rate of progress is not great because the rate of reproduction among Rhinos is very slow. 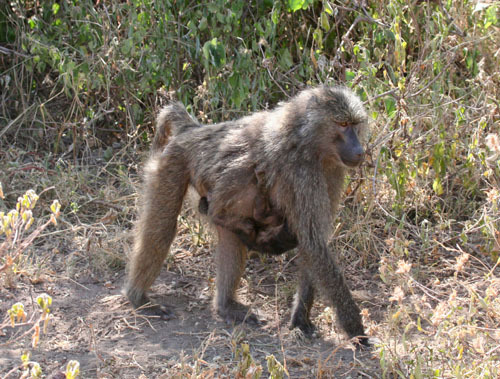 The females reach baby-bearing age at between 5 and 7 years, they produce one baby at a time, and they don’t have their next one for another 5-7 years. After having our box lunches at a picnic area near a pond, we resumed our drive through the Crater. We spotted a Wildebeest mother giving birth. The baby was up and running within minutes. They do not want to be left behind, because that spells doom in the heavily predated plains of Africa. The instinct to survive has created amazing physical adaptations. A few Golden and Black-backed Jackals were out looking for food. 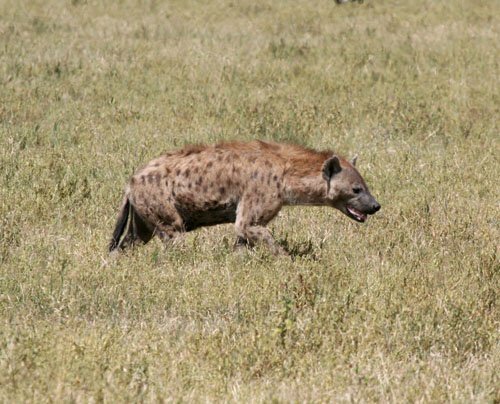 The Spotted Hyenas were jogging along among the zebras and wildebeests. 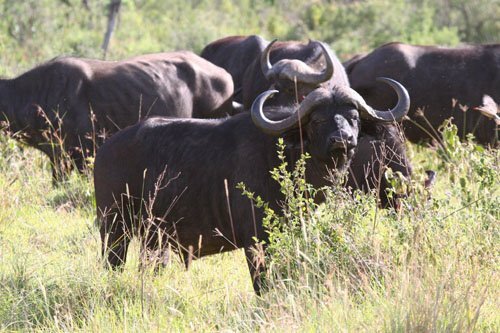 We didn’t pay much attention to the herds of Cape Buffalo. We assumed we would see many more in the days to come. As it turned out, we saw very few after we left the Crater. We did see two more Rhinos just before we exited the Crater. They were lounging in the shade of a tree quite a long distance from the road. We returned to the Coffee Farm and enjoyed a relaxing evening. On February 5th Raymond picked us up in his Land Cruiser. First stop was a large souvenir shop that offered, among many other items, Tanzanite jewelry. Tanzanite is a beautiful blue stone found only in Tanzania. It was discovered about 40 years ago. We had considered buying Tanzanite jewelry as a memento of our trip. We did not have the energy or the time to look at the outlets in Arusha. In any event, when we looked over the items, which were indeed beautiful and expensive, we were unsure of their real quality and actual value, so we chickened out and did not buy any. On the way to Tarangire National Park we saw colorfully dressed people of the Maasai tribe. Their villages covered the landscape. 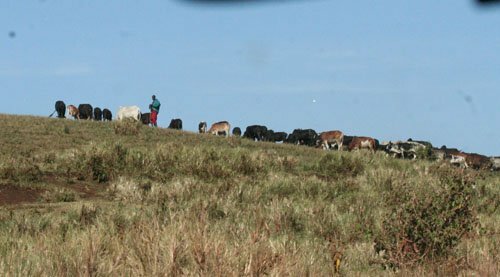 They have many herds of cattle which they move to various water supplies and grassy areas each day. Their society is organized into male age groups. We saw a few boys who were passing through initiation to become a warrior and eventually an elder. Once at Tarangire we drove through expansive, acacia-dotted dry savannah. Elephants and Giraffes were plentiful. There were numerous small Weavers and other grassland/acacia scrub inhabitants. We stopped for a picnic lunch on a bluff overlooking the Tarangire River, which was nearly dry. From there we observed a pair of Tawny Eagles hanging out at the water’s edge. 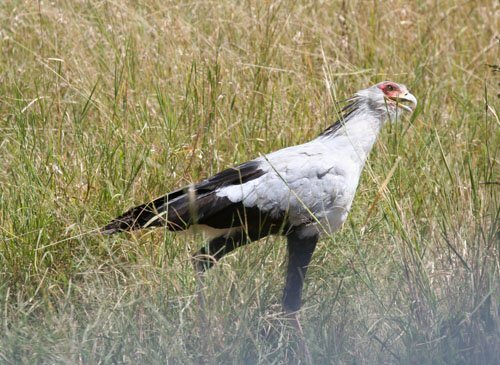 A Secretary Bird was walking through the grasses near the water. 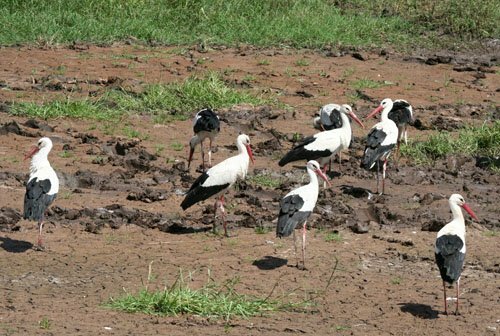 White Storks by the hundreds stalked insects in the grass. We arrived at Kikoti Camp fairly late in the afternoon. This is a permanent tented camp with 10 tents. The accommodations were excellent and we enjoyed a very delicious meal in the dining tent. We were escorted back to our tent by a Camp Guard, because the Camp is unfenced and all sorts of large animals roam through it at night. 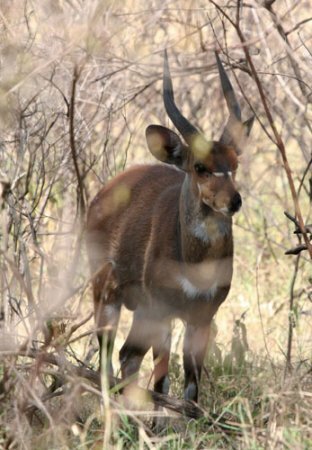 On the way back we spotted a Bush Buck just a few feet from the path. After a bountiful breakfast, we returned through the Park driving toward Lake Manyara. 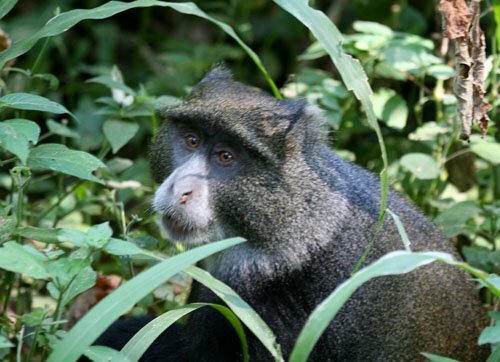 Many monkeys and Baboons were out and about. 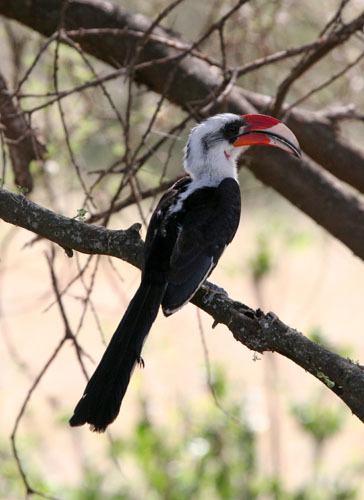 We also spotted a Von der Decken’s Hornbill. As the afternoon wore on, I faded out as we made our way to Kikoti Camp for the night. I came to when Barbara shouted “Stop, stop, there’s a Cheetah”. 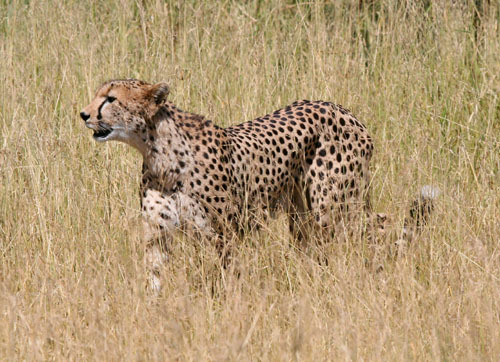 To my surprise, and, I think, to the surprise of Raymond, indeed there was a Cheetah, slinking along in the grass beside the dirt road. Primary objective number 1 was accomplished, and very early in the trip. The pressure waned noticeably, as Barbara excitedly shot numerous photos of the Cheetah as it moved ahead of us and crossed the road. It is a beautiful animal and I will never forget this first sight of one in the wild. On, then to Lake Manyara. Not many birds were to be seen along the way today. We stopped at a “hippo pond” which appeared to be no bigger than a swimming pool. 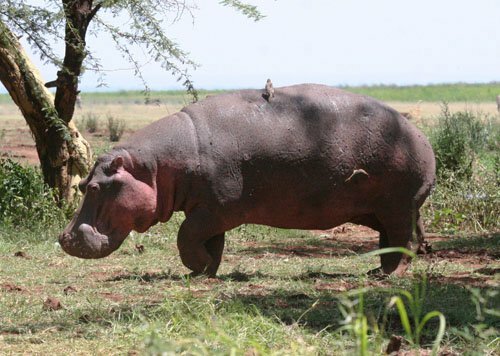 We debated stopping, finally did, and were rewarded by a great view of a Hippo on land, for a change. The Lake itself was full of Flamingos. Late in the afternoon we arrived at Serena Lodge. We enjoyed a couple of cool Kilimanjaro and Safari beers while we sat by the pool and the pool bar as evening descended. Interestingly, quite a few birds came to the pool to drink. Among them, Black Bishops, Baglafecht Weavers, and several other “firsts” for the trip. Dinner again was delicious and we retired early to prepare for an early start toward Ngorongoro Crater the next morning. Barbara and I were in Tanzania from February 3 through February 14th, 2012. 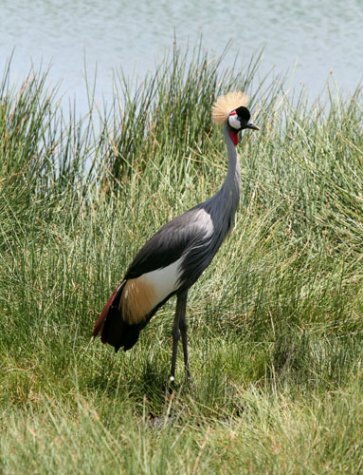 Our previous visits to Africa were to Egypt quite a few years ago and to Botswana and Zambia in 2007. Egypt was rich in history and culture, to which we were exposed during a trip north on the Nile River from Aswan to Cairo and in Cairo itself. 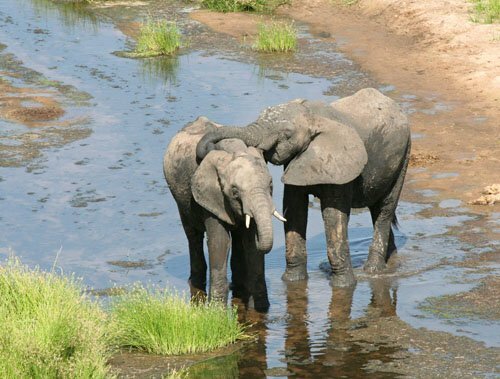 Botswana possesses great natural beauty in a pristine and safe environment. We stayed at 4 very different camps in Botswana. 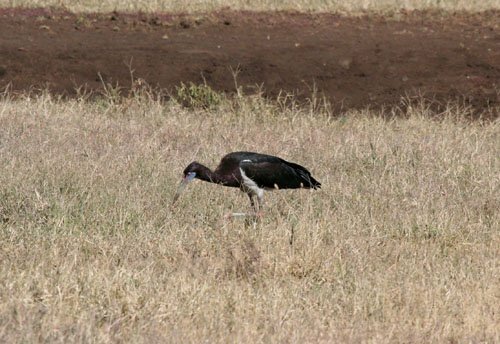 The birds, animals and vegetation were of wonderful variety and observable close-up. Our final stop was at Livingstone, Zambia, the site of the incomparable Victoria Falls. Our choice of Tanzania in 2012 posed a dilemma for us, as we wanted to see the great migration of the zebras, wildebeests and other animals through the Serengeti, and we had thought of the Serengeti as a Kenyan destination. 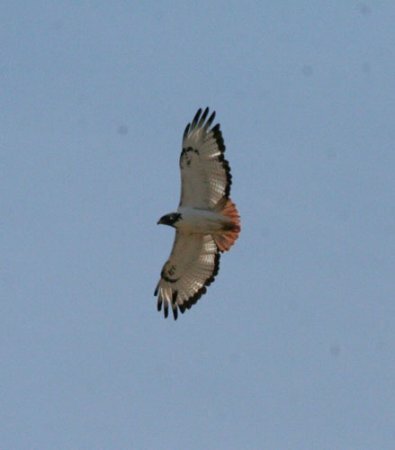 Our research led us to conclude that we might see more in Tanzania, on the southern part of the Serengeti. We hoped especially to see Rhinoceros and Cheetahs, and it seemed that our chances of that would be better in Tanzania. We worked with Kensington Tours to help us plan our itinerary. We flew Ethiopian Airlines from London to Kilimanjaro, Tanzania, (by way of Addis Ababa). Our approach to Kilimanjaro was rough and the Mountain was obscured by clouds. We were met at the baggage area by the young man, Raymond, who was to be our guide and driver during our entire Tanzanian tour. He was excellent company and a great guide, with a thorough knowledge of Tanzania’s animals, birds and vegetation. We could not have asked for a better companion for our trip. Raymond drove us to our first accommodation, the Serena Mountain Village Lodge near Arusha. 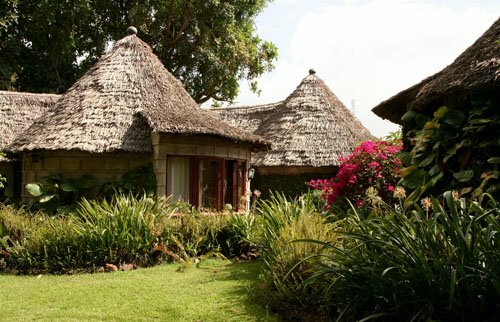 It is modeled on an African village with separate guest facilities, each covered by a thatched roof. a Red-headed Weaver, a Lizard Hawk and a lot of unidentified fly-overs. Dinner at the Lodge was very good and we enjoyed meeting a few of the other guests during the pre-dinner cocktail time. 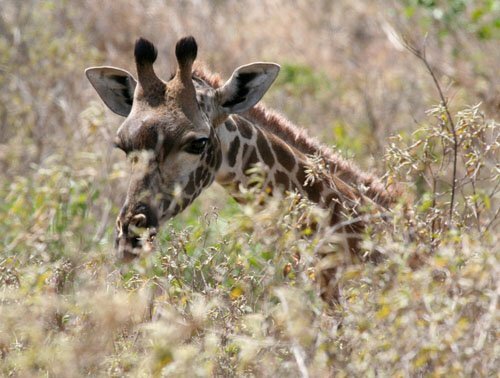 We had thought about doing some shopping on that first day, or the next day, especially for some Tanzanite jewelry, but we were too tired the first day and we wanted to use the second day exploring the nearby Arusha National Park. Raymond picked us up about 8:00 a.m. and drove to the Park. In the distance we could see Mt. 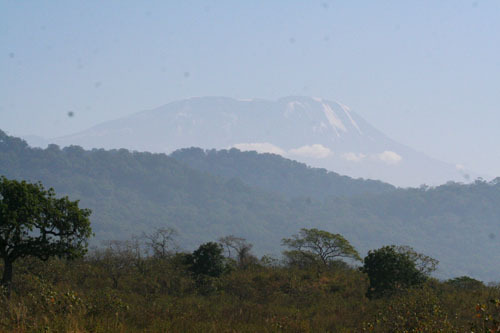 Kilimanjaro, the tallest mountain in Africa at an elevation of 19,300 feet. It is also the tallest free-standing mountain rise in the world, rising 15,100 feet from its base. It is comprised of three distinct volcanic cones. The period from 1912 to the present has seen the disappearance of more than 80% of its ice cover. 26% of the ice present in 2000 had melted by 2007. The prediction is that it will become free of ice between 2022 and 2033. Cape Buffalo, the diminutive Kirk’s Dik-Diks, and Bushbucks. 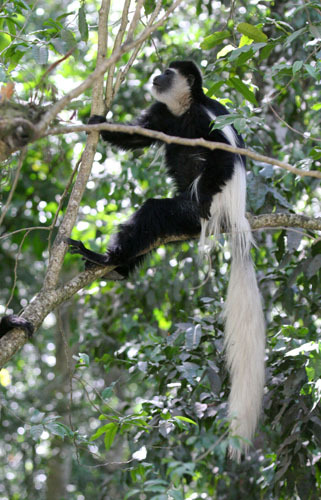 The best find of the day were the Black and White Colobus Monkeys. A close second were the Blue (Sykes) Monkeys. Olive Baboons (a subspecies of the Chacma Baboon) were present in big numbers here, as they were throughout the remainder of the trip. Cape Teal, Black Saw-wings, several species of Bee-eaters, and Augur Buzzards. We spent a long day in the vehicle and returned to Serena Mountain Village in time for another good Tanzanian beer and a very good dinner before walking back to our hut under a beautiful starlit sky, and retiring for the night. As everywhere, mosquito netting enveloped our bed, but we saw virtually no mosquitoes anywhere.